I don’t know if they were having a war, or what, but this is what greeted me today on my return from two weeks of house sitting elsewhere. Thankfully quite dead, both of them. After backing up slowly, breathing deeply, and confirming no current movement, I went to fetch some weaponry, just to make sure. When I got back and there hadn’t been any movement while I was gone, I inspected a little more closely and saw the folded legs and lowered tail. Then I looked around the kitchen further and saw another casualty. This one was over in the corner, completely suspended in a web until I poked it with a flip flop to see what it was and whether it was alive. I thought it might be a leaf at first. 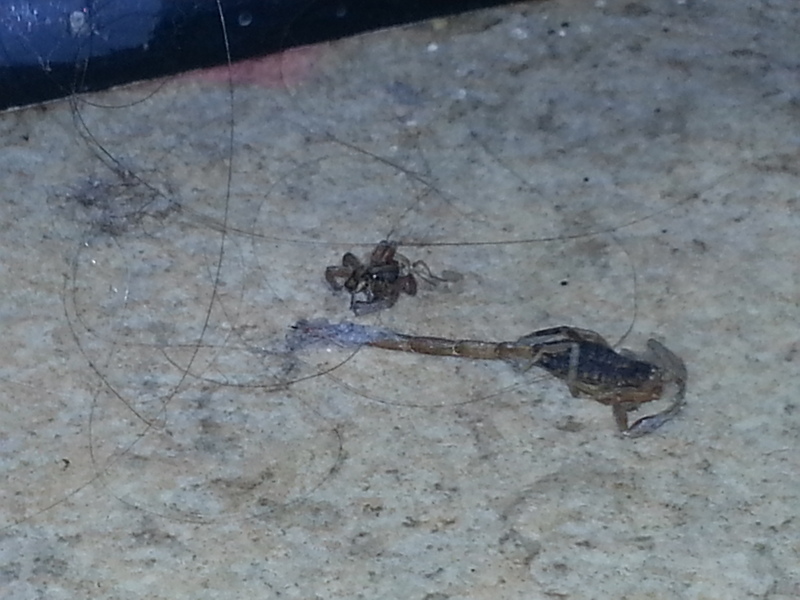 Three dead arachnids in my kitchen. That’s a lot of legs and a lot of bodies. I can’t stop my imagination from wondering at it in a slightly horrified way. How did it go down? The one in the web had much smaller pinchers than the other one. Is she the girl who went out for groceries and never came back? Did the spider get cocky ’cause it handled her and thought the male would be no problem when he came hunting? When did it know it had bitten off more than it could chew? Who got the first hit, that they wound up dying next to each other? There’s something white on the scorpion’s tail – possibly spider web. Did the spider do it while dying of his injuries? Or did he think he had it won and didn’t realize the scorpion’s poison was working through his body? Anyway, overactive imagination aside, after I took pictures and carefully swept them up, I did go check the baseboards and corners in the rest of the house, just to be sure. Even thinking about all those little legs makes my toes nervous. I am a Missionary Kid (MK) enjoying navigating this life with the unique viewpoint that has given me. 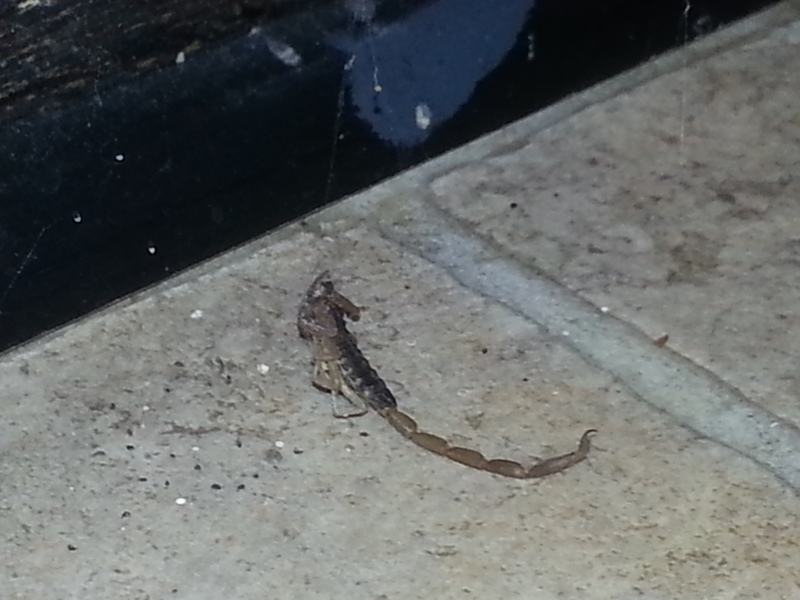 This entry was posted in Uncategorized and tagged arachnids, bugs, creepy crawlies, scorpions. Bookmark the permalink. Maybe the spider was the girl who went out for groceries and never came back and her boyfriend is still on the warpath after having easily handled the two scorpions. The argument against that theory, though, is why wasn’t the second scorpion strung up? That scene I didn’t disturb, unlike the other. Erk! Happy to say I have never found a scorpion in my kitchen (we don’t have them in these here islands) but I have found a white-tail spider or two in my bedroom. Tim carries them out and then I jump up and down on them in my boots til they are no longer distinguishable from the earth. Ewww! I probably would have screamed. It’s been a while since we’ve been in touch. How are you? Give me a call. Bringing Home Holland An international special-needs adoptive family with four kids from China, great blog. No Greater Joy Mom Written by a mother of multiple special needs international adoptees. Pitter Patter Art Blog by a super-artistic mom of four, two adopted from Ethiopia. Splashes of Beauty Blog by a friend of mine from high school, about her journey as a new missionary. The Blessing of Verity Blog by a mother of many, two internationally adopted, and orphan advocate. The Choate Family Blog by a fabulous missionary family that work with my parents.